Today, the Rebelle Rally announces the return of Hoehn Adventures as presenting sponsor of 2018 competition, slated October 11-20, 2018. The unique event is the first women’s off-road navigational rally raid in the U.S. Since the inaugural rally in 2016, Hoehn Adventures has been a key supporter, not only as a sponsor, but fielding teams of employees and family members to compete in the rally. Hoehn Adventures, under the umbrella of the 11 brand dealership automotive group Hoehn Motors in Carlsbad and Temecula, was established with a mission to inspire those who love the power of challenge and the joy of pushing boundaries through an evolving series of automotive events across the world. With the Rebelle, they’ve taken their mission and expanded it. Not only did they help launch the rally since day one, they recognize the positive impact the competition has on women, including Hoehn employees. Their belief and overall dedication to women in the workplace earned them the Lorraine Schultz Spirit of Leadership Award in 2017. 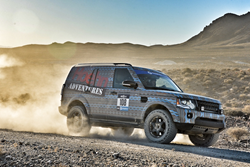 Not ones to step away from a challenge, this year they are fielding two teams in Land Rover L4s in their immediately recognizable, artistic vehicle wraps. Jo Hannah Hoehn, GM of Jaguar Land Rover Carlsbad, knows firsthand the impact the Rebelle has personally and professionally. Competing in 2016 and 2017, Jo Hannah will once again pilot a Hoehn Land Rover in this year’s rally. “We are very proud to support an event that not only showcases our product, but also our brand and our core values as a company. And as a competitor, I can’t wait to see what the 2018 Rebelle has in store,” stated Hoehn. Hoehn’s partnership, including sending teams, is an example of their “walk the walk” approach. With over 80 years in business and four generations at the helm, Hoehn Motors brings their long-standing reputation of world-class service and experience not only to the San Diego community, but to the rally as well. This year, the event will start in Lake Tahoe on October 11th, and traverse over 2,500 kilometers of legal roads and multiple basecamps across the desert. The finish, Rebellation, will take place along the coast of San Diego with a public daytime awards podium and evening celebration on October 20th. This will be the first year the Rebelle hosts a daytime event open to the public on the last day of the competition. The evening gala will take place along the water at Coasterra, and is open to ticket holders. In a short period of three years, the rally has grown in size and influence with “Rebelles” in 136 cities, 35 states/provinces, and 7 countries. The Rebelle Rally is an event with a unique challenge and scoring system where precise navigation, not speed, is the ultimate goal. Participants trade in cell phones and GPS for old-school navigation in a competition with the elements of time, distance, headings and hidden checkpoints. Armed with just maps, compasses, and roadbooks, up to 50 teams of two will be pushed to their limits as they make their way across 2,500+ kilometers of Nevada and California’s iconic terrain. In 2017, the Rebelle Rally partnered with Tread Lightly! as their outdoor ethics partner. The long-standing, non-profit organization promotes responsible recreation through stewardship, education, and communication. The Hoehn family has been in the car business since Hoehn Chevrolet was founded in 1928 by Theodore W. Hoehn. In 1938 the company, headquartered in Memphis, Tennessee was transferred to Theodore W. “Bill” Hoehn, Junior. After moving to La Jolla, California for what turned out to be a short-lived retirement, Bill founded Hoehn Motors in Carlsbad in 1975. Bill's two sons Bill and Bob now own the business. Today, there is a fourth generation of extended family working in the business. The Hoehn name represents Acura, Audi, Buick, Cadillac, GMC, Jaguar, Land Rover, Porsche, Sprinter and their original brands, Mercedes-Benz and Honda.